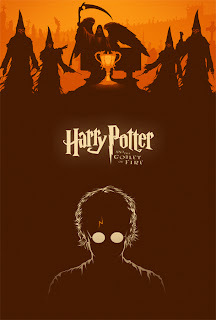 Another Harry Potter poster! 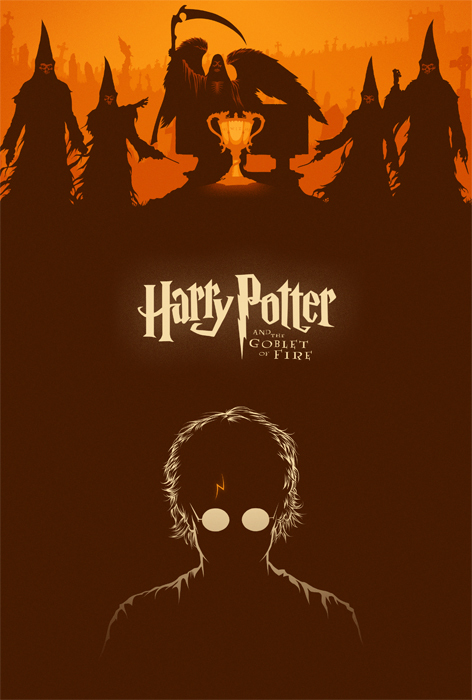 This time it's for the fourth film in the franchise, Harry Potter and the Goblet of Fire directed by Mike Newell. Because this is the film that marks the first real appearance of Lord Voldemort (played brilliantly by Ralph Fiennes) I wanted the scene at the top of the poster to be where he returns - the Little Hangleton graveyard. 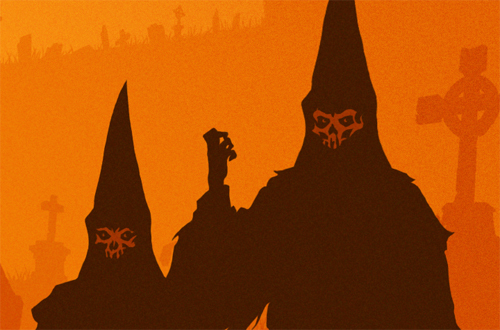 In the upper right corner of the poster, you can the Riddle House overlooking the graveyard. In the center stands the Triwizard Cup that transports Harry to the graveyard at the end of the Triwizard Tournament. The cup sits at the base of the very sinister "angel of death" tombstone on the Riddle grave and is flanked by Voldemort's Death Eaters - thankfully, the later films would redesign the Death Eaters' costumes to be much less reminiscent of a certain evil organization. I'm fairly certain that the "Death Eaters" name alone already sells that they're bad. Well that's 3 films down, 5 to go. Next up is the fifth, Harry Potter and the Order of the Phoenix, which will be out in one week! Any chance you'll be able to purchase the 8-film set at a discounted rate when you'll all finished. These are AMAZING! They're exactly what I've been looking for FOREVER! I love your work! Can't wait to see the other 5! Thank GOD! I can't tell you how much I adore these. I've been looking for a good minimalist, comprehensive set of HP movie posters FOREVER and yours are EXACTLY what I've been looking for. They are just stunning. I love the simplicity and the artistry. Can't wait to see the rest! Also, I had a minor panic because I forgot your name and was worried I wouldn't be able to find my way back through the internet maze. Luckily, I found the link from SlashFilm.com again.